Formerly only available as an expensive import, this excellent value CD groups together three separate live sessions from Paris, all dating from 1958, with the added bonus of dates in Denmark and Germany, and, judging by the quality of the sound recording, are possibly radio broadcasts of the era. The Paris concerts form the majority of this near seventy-five minute CD and feature a line up of the cream of French jazz musicians with Martial Solal and René Urtreger alternating on piano duties, Pierre Michelot features on bass (replaced on two numbers by Jean-Marie Ingrand) with long-term expatriate Kenny Clarke on the drums and fellow countryman and guitarist Jimmy Gourley participating on several tracks. Getz was a fully matured musician by this time, having passed his thirtieth birthday a year earlier, and his sound is instantly recognisable. A classic selection of jazz standards and the Great American Songbook includes some old favourites that Getz would return to subsequently throughout the decades. They include a sumptuous rendition of ‘East of the Sun’ and a melodic take on ‘Dear old Stockholm’, the latter featuring some delicate guitar licks from Gourley. 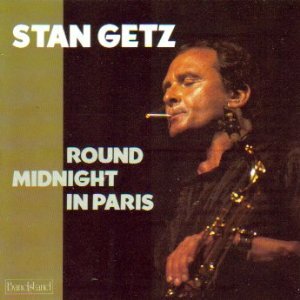 Europe was in fact a good place for Stan Getz to be and in the mid-1950 served as an escape from his drug addiction, staying for a period in Scandinavia. In the inner sleeve notes which provide a useful biography of Getz in the mid-late 1950s, reference is made to a Downbeat article from 1960 which explained that Getz, like many American expatriate musicians, found more time to develop their craft when sojourning in Europe and were consequently free of other pressure back home. A spine-chilling and emotional interpretation of ‘Round Midnight’ showcased Getz’s ability to milk a ballad for all it’s worth, while for some thrilling contrast his love of be-bop comes shining through on a slightly less frenetic version of Tadd Dameron’s ‘Lady Bird’ and a fascinating take on ‘Cherokee’ which was virtually a signature tune for Charlie Parker. Rounding off matters with a jovial ‘Get Happy’, Stan Getz was just about to hit his prime and this fine effort is a marvellous document of the tenorist in a live setting.